Precise, programmable, and easy-to-use, the Sekonic L-758DR-U DigitalMaster Light Meter, available here with PocketWizard radio triggering support, will provide users with the best way to measure their lighting for the utmost in control either in the studio or on location. The L-758DR-U is exceptionally versatile as it performs either incident or spot metering of ambient and flash lighting. Incident metering is possible with a lumisphere on a rotating head. The lumisphere is also retractable for accurate contrast readings. Alongside the more standard sphere is a 1° spot meter with a viewfinder equipped with a full display. Additionally, the L-758DR-U has a wide measuring range of -2 to 22.9 EV at ISO 100, as well as a flash range of f/0.5 to f/161.2. A huge advantage of the L-758DR-U is the ability to be programmed with optional exposure profiles in order to match the dynamic range of your specific camera. Also, up to nine readings can be memorized and displayed on the screen, and once programmed the meter will show the latitude of your camera as you make measurements. A Contrast Function can further help by allowing direct comparison between a standard mid tone and other measurements. Another feature is the ability to measure both ambient and flash in the scene, with a percentage of how much flash is used. This allows you to see the relationship between the two in order to balance the exposure as needed. Finally, this model is designed for demanding professionals, featuring a large backlit LCD and an all-weather construction. Box Dimensions (LxWxH) 10.1 x 6.4 x 3.8"
L-758DR-U DigitalMaster Light Meter for PocketWizard System is rated 5.0 out of 5 by 8. Rated 5 out of 5 by Michael from Works as advertized Meter readings for landscape work are spot on, the ability to profile your cameras dynamic range and upload it to the meter allow you to shoot high contract scenery without resorting to exposure bracketing. Less valuable for low contrast shoots which can be handled by in camera system. Big learning curve to be able to use it under all shooting conditions and with the price in the mid $600 range this is definitely not for the casual shooter as you would never be able to justify that price for the marginal improvements you get. I purchased it mainly for landscape work and haven't yet had the chance to use it indoors under flash or artificial lighting conditions. The unit is well made, the metering is dead on for exposure control and does everything it is advertised to do. Rated 5 out of 5 by Peter L. from Beastly This meter has all the tools you could ever need in the studio or outside. In just the first week of using it, I've had opportunities to use incident, reflected, spot, and flash metering. In every case, the exposure was nailed. It's the perfect accessory for studio work, and I also use it a ton when shooting waist-level with a Hasse. It is LARGE, make no mistake. It will take up some room in your kit. Rated 5 out of 5 by Anonymous from Correct Exposure First Time No matter how complicated the lighting problem, my L-758DR syncs easily with my pocket wizard system. And no cables connect my L-758DR-U with the Pocket Wizard System. This meter provides me with the right tools to nail my exposure right on. Mostly on the first shot. Whether indoors or outdoors, good or bad weather, portrait or landscape, the L758DR-U does the job well. Rated 5 out of 5 by Richard from So many meters all in one. Awesome! I was really just looking for an incident meter and spot meter and flash meter in one. This is it. Easy to use and to read. I have not yet used the radio signal for flash, mainly incident and spot. Love it ! Battery is one CR-123 about $12 each. Love the generous off-delay or you can shut off manually. The white dome is retractable which is nice. Overall, yes I would recommend to anyone. Rated 5 out of 5 by Scott from I would purchase this item again. Poor documentation, but highly intuitive and very easy to use. Indicated exposures are deadly accurate in all measurement modes. Rated 5 out of 5 by Anonymous from Great buy Long time light meter wanter, first time owner. Incredibly happy I purchased this unit. The features are very easy to use and I have found the spot meter very helpful. Rated 5 out of 5 by Enrique Huaiquil from Amazing Excellent product and very easy to understand. Is calibrating the meter necessary in order for it to work properly? I'm not sure I want to spend $132 plus time to calibrate when it should work right out of the box. If it was purchased through an authorized dealer in the US any warranty work will be done at no charge. If you press the two ISO buttons at the same time and turn the wheel you can calibrate the meter yourself, to match your camera. This is what should be done. All cameras vary. Dose the Sekonic RT-32N Radio Transmitter Module have to be purchased separately or dose the L-756dr-u come with it? Is it different between L-758DR and L-758DR-U? Can it compatible with Sekonic Exposure Profile Target II and ColorChecker Passport Photo? Asked by: OR PIYAPONG P.
The U designation was created to assure that customers got the meter that was designed for the marketing area for which it was designed. There are other designated models for other areas in the world. The major reasons are radio-compatibility with PW triggers and warranty repair. Websales were allowing meters designed for non USA area to be sold in the USA where they are not compatible with PocketWizard USA radio receivers. Warranty service is the responsibility of the distributor of the market area and they are not responsible for service of meters what were sold in from other areas (the meter would have to be shipped back to that out of the USA distributor for warranty service). The L-758DR-U is fully compatible with the Sekonic DTS system and targets. Can this meter use rechargeable CR123A batteries, such as Tenergy RCR123A? These batteries have a higher initial voltage than the standard non-rechargeables. Best to Stay with the lithium batteries. 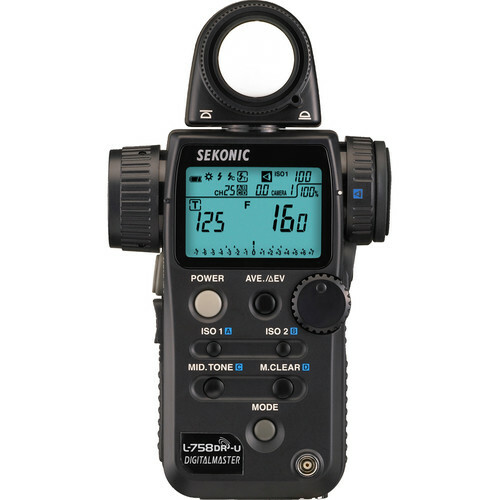 Apart from price, how is this L-758DR-U (&lt;a href= http://www.bhphotovideo.com/c/product/1219221-REG/sekonic_401_756_l_758dr_u_digitalmaster_light_meter.html/prm/alsVwDtl target= _blank &gt;http://www.bhphotovideo.com/c/product/1219221-REG/sekonic_401_756_l_758dr_u_digitalmaster_light_meter.html/prm/alsVwDtl&lt;/a&gt;) meter technically different from L-758DR (&lt;a href= http://www.bhphotovideo.com/c/product/460371-REG/Sekonic_401_758_L_758DR_DigitalMaster_Flash_Meter.html target= _blank &gt;http://www.bhphotovideo.com/c/product/460371-REG/Sekonic_401_758_L_758DR_DigitalMaster_Flash_Meter.html&lt;/a&gt;)? The 758DR is a very good example of the new Sekonic world-market branding. In the USA, the packaging is new and product designations end in U . The 758DR has an incorporated radio antenna and transmitter module for PocketWizard USA triggering standards. It is designed to work with the PocketWizard radios system in the USA. It is possible to purchase the 758DR that is made for markets other than the USA and has a different antenna which works with PW in a different frequency (433Mhz). You pay for this feature when you buy the meter and if not a USA market model, it will never be able to work with the USA PocketWizard system. A meter made for a different market also does not carry a USA warranty. Any warranty service would have to be performed by the country the meter was originally intended to be sold in. The USA warranty is 3-years, the longest available in any Sekonic sales area. That said, B&amp;H always sells the USA specified product and never imports products outside of normal USA channels. You can expect to get the very best product and service from a product purchased at B&amp;H.